CTET 2018 Answer Key – CBSE has released CTET Final Answer Key 2018 for the set I, J, K, L, N, M, O, P on January 07, 2019 at ctet.nic.in. The answer key for Paper 1 and 2 has been released. Along with this the public notice for the candidates who want to avail the calculation sheets, with OMR copy also released. The candidates have to pay Rs. 500/- on or before February 07, 2018. The final answer key is in the form of pdf, which contains the correct answer. The result of CTET 2018 is expected to be available in January 2019. Check more details about CTET 2018 Answer Key from this page. Latest: CTET 2018 Final Answer Key has been released. Check the same from below. CTET Paper 1 Final Answer Key 2018 – Available for Set I, J, K, L! CTET Paper 2 Final Answer Key 2018 – Available for Set M, N, O, P! Set wise CTET 2018 answer key links are given below for both Paper 1 and Paper 2. Central Teacher Eligibility Test is conducted by CBSE. The exam is held in offline mode and the CBSE, releases the answer key for it. Along with the answer key, the OMR sheet and the objection window is open as well. The candidates can submit their objections till December 30, 2018 by 05 pm. How to Download CTET 2018 Answer Key from the Login? Answer Key: Click here to download the CTET Official Answer Key 2018. Go to ctet.nic.in. or on the link provided above. Click on the link for ‘CTET 2018 Answer Key’. Then, enter registration number and password to access the login. Check and download the answer key of CTET 2018. How To Raise Objection on CTET Answer Key 2018? To raise the objection the candidates have to pay the fee. The fee has to be paid for a question. At first, the candidates should be certain about his/her explanation for the answer. Then only the objection should be raised along with the proper reference. Without any reference, the objection will not be considered. The candidates have to use the same link for raising the objection which is provided above. The candidates have to pay an amount of Rs. 1000/- for each question. The mode of payment for raising the objection is online, they have to pay it through Debit Card/ Credit card. Note: The candidate should remember that the fee is non-refundable in case you challenge is rejected. Or if the news gets accepted then, the fee will be refunded in the account online. So remember to use your own credit card/ debit card. 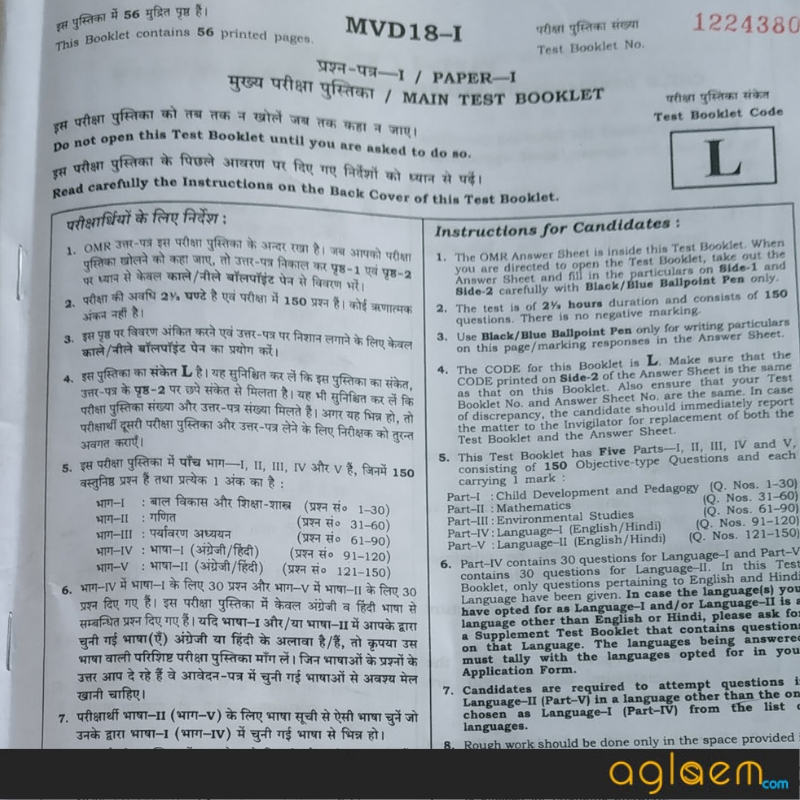 How to Get Photocopy of OMR Sheet with CTET Answer Key 2018? According to the latest notification by CBSE, the OMR sheet and the Answer Key of CTET examination will be displayed on CTET website ctet.nic.in. The candidates will be able to see the answer sheet in the login. If any of the candidates wants to get the OMR sheet then they may also do so. To get a photocopy of the CTET OMR Sheet, the candidates will have to pay Rs. 500 to CBSE. The money is to be paid via Demand Draft, which is to be prepared in favour of Secretary, Central Board of Secondary Education, payable at Delhi. Candidates can make the DD from any Nationalized Bank. How to Calculate Marks through CTET 2018 Answer Key? Exam pattern of the question paper for CTET Paper 1 is as follows. Exam pattern of the question paper for CTET Paper 2 is as follows. Once candidates get the answer keys of CTET 2018 exam, candidates can get an idea of the marks in the exam. Before proceeding to calculate marks, ensure that you are matching keys against the question paper set / code received by you during the exam. Check the number of options you have marked correctly in the exam. For each correct answer, you will get one (1) mark. Total marks = (Number of correct answers) x (1). It is very clear that the unofficial answer key of CTET 2018 is that which is released by the coaching institute. Whereas, the official answer key is provided by CBSE. The unofficial answer key may or may not be released for all the Paper and sets. Whereas, the official CTET answer key will be available for all the sets and Papers. The unofficial answer key is little less reliable. However, candidates can still use it to predict their performance in the examination. The official answer key is more reliable. However, if the candidates feel that there is error(s) in the official key then the candidates can submit objections against it. In order to qualify in the Central Teacher Eligibility Test, candidates need to obtained the CTET cut off marks. As published by CBSE in the CTET 2018, the cut off score is as follows. CBSE will issue Eligibility Certificate to candidates securing 60% and above marks. Hence, candidates should get upto or more than 90 marks to qualify the exam. The result of Central Teacher Eligibility Test (CTET) 2018 exam will be declared on the official website. All test takers can check CTET results online at www.ctet.nic.in. To check result, enter roll number as issued during filling up of the application form. It is expected that the result of CTET 2018 will be available by 3rd week of January 2018. 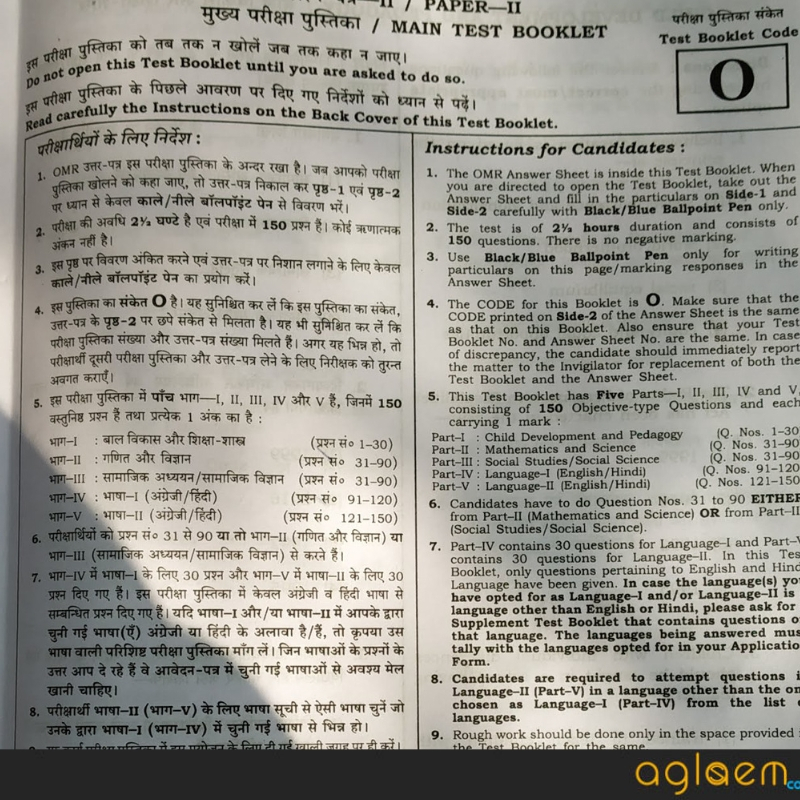 All questions in CTET test are Multiple Choice Questions (MCQs), each carrying one mark, with four alternatives out of which one answer will be correct. There will be no negative marking. After the results declaration, CBSE will issue CTET marks statement in January 2018, onwards. 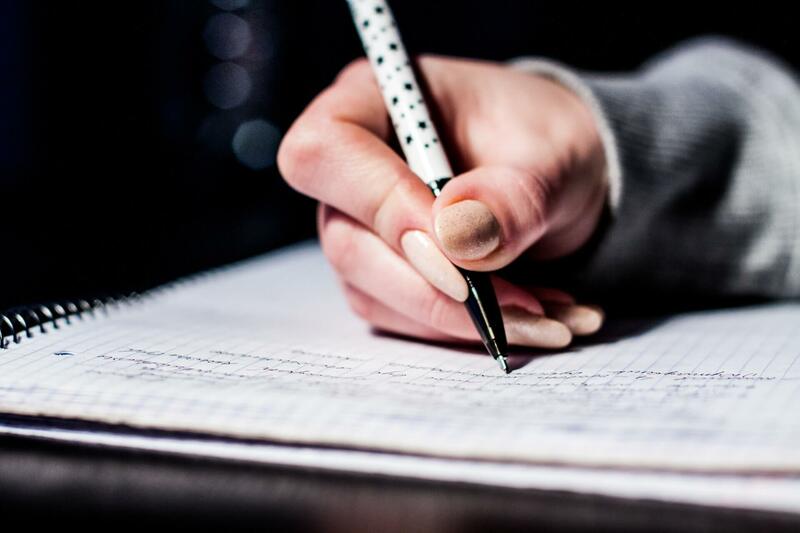 Answer keys of CTET Paper 1, and Answer keys of CTET Paper 2 are for the primary stage, and elementary stage respectively. There are four different sets of CTET 2018 question papers. Check the CTET Answer Key 2018 for respective set only to know the actual answers. CTET 2018 answer key of Paper 1 contains answers of 150 MCQs of Child Development and Pedagogy, Language I, Language II, Mathematics, and Environmental Studies. CTET 2018 answer key of Paper 2 contains answers of MCQs of Child Development and Pedagogy, Language I, Language II, Mathematics and Science, Social Studies / Social Science. CTET 2018 Answer Keys by coaching centers is released a few hours after they exam, and the were given here for the reference of candidates. You may have estimated your marks as per those keys, but keep in mind that calculation of scores for CTET Result will be done according to official CBSE CTET Answer Key 2018. Central Board of Secondary Education is not only releasing official CTET 2018 Answer Keys but also inviting objections. In the given time duration you can login to check official CTET Answer Key 2018 and know precisely the correct answers. Ctet exam paper 2nd math and science answer with all parts language 1st hindi and language 2nd English and child development answer key download. Please send me. I had given language 1 as English ( questions 91 to 120) and language 2 as Hindi ( questions 121 to 150). How to check this in answer keys released by CTET as it shows all 91 to 150 in language 01 only..